This post was originally written by A.S. on the Yahoo Ragged Cloth Cafe email list. It has been transferred here with an image, as an example of how this format for Ragged Cloth might work. For this month I chose Wolfgang Laib. He is one of my favorite artists, and I’m excited to see how you all interpret his art and apply it to fiber arts and your own work. I don’t want to lead the direction of the conversation too much, however, so for today I’m just going to post some things for you to read. I hope you will respond with your thoughts, feelings, and ideas. Wolfgang Laib finds spirituality in the simplicity of everyday, organic substance –”milk, pollen, beeswax, rice”–that provide sustenance or engender life. In 1975 he created his first Milkstone in what has become an ongoing series of elemental sculptures. A rectangular block of polished white marble containing a slight depression on its upper surface, the piece is filled with a thin layer of milk to foster the illusion of a solid form. Though an inert object, this sculpture requires ritualistic participation. Laib performs the first act of pouring the milk when the piece is displayed, but after this initial gesture, the collector or museum staff must clean and refill the stone each day it is on view. 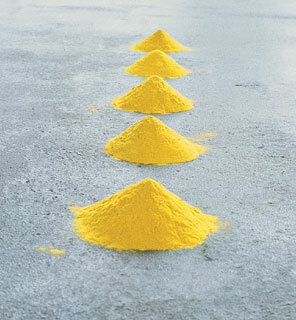 Ritual plays a central role in all of Laib’s highly reductive art. He lives in a remote region of Germany’s Black Forest, communing with the natural world outside his house as a painter would work in his or her studio. During the spring and summer months he collects pollen, including dandelion, hazelnut, pine, buttercup, and moss varieties, from the fields surrounding his home. He displays this laboriously gathered material in simple glass jars or sifts it through sheets of muslin directly onto the floor to create large, square fields of spectacular color. He also molds the brilliantly pigmented dust into cones, as in The Five Mountains Not to Climb On. Though intimate in scale and intensely fragile, this hazelnut pollen sculpture alludes to the monumentality suggested by its title. The notion that there is infinitude in the infinitesimal is beautifully manifest in Laib’s spare but highly aesthetic practice. Klaus Ottmann: You studied medicine. How did you get into art? Wolfgang Laib: The more I knew about the natural sciences, the more I saw that they were too narrow for me and itâ€™s just not what this body, what all these things are all about. Ottmann: Did you ever think of going into something like holistic medicine? Laib: No, because that would have been too small a step, and I tried to make a big step. Itâ€™s not about homeopathy or anything like that. Ottmann: What kind of art did you start with? Laib: I left university and half a year later I was already making my milkstones. Ottmann: Where did you get the idea for the milkstones? Laib: The milkstones are the direct answer to what I left, to what I found milk and stone are about. Because milk is not what is told in hygiene. You can teach everything about this liquid but have no idea of what it is. Ottmann: When did you start working with pollen? painting itself won’t be much reflected in the final product. reassess what that does to the whole work, alter something else, etc etc. — but with these artists it seems the act IS the final product. contemplative place to come up with his contemplative art? partly because I am more familiar with Goldsworthy’s work than Laib’s. throwing parties like Andy Warhol’s? post and say, less fluid, perhaps. *he* personally couldn’t live in a city. . . .